The Fiat 500L Living is closer to the Panda’s values than the regular 500’s. It is a car conceived for roomminess, and practicality, like the Panda. Normally I use this blog to talk about everything related to Fiat Group. New cars, strategies, and results are all part of this site. I always try to write based on information, data, and facts that allow me to give my opinion about what the group should do or not. It’s true that I’m a close follower of all brands of the group, and it means that I always try to be very objective in my opinions. When there are good things I expose them without any problem. And when there is something wrong I try to analyze the problem and propose a solution. 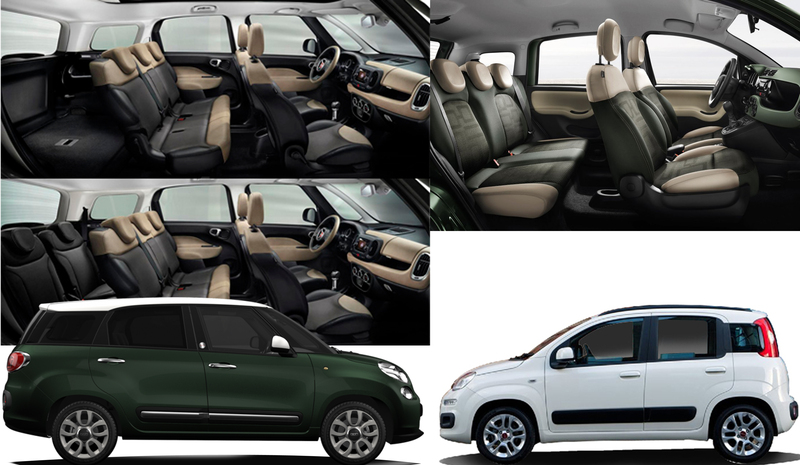 Recently, Fiat Europe presented the 500L Living and started a new product strategy that, in my opinion, are both wrong. The 500L Living is not a bad product. After the success of the 500L, based on the Fiat 500’s values, the brand decided to enlarge the family with a 7-seater minivan for a segment between B-MPV and C-MPV. It is always good to be the first in those segments where no other is. The 500L Living will be a good option for those looking for a roomy MPV in a small package. Exterior design may not be the most beautiful, but no one can’t deny that it is a practical car, full of functional features. And that’s where I see the mistake. The new-born Fiat shines in terms of functionality and fails in terms of design, and that’s the opposite of the small 500’s values. The 500L is full of details and stylish ideas that perfectly fit with the small iconic car. But the larger version of the this MPV is closer to the Panda’s ideas than to the 500’s. That’s why I think Fiat should had developed this larger MPV under the Panda’s design language, so it could enjoy of the popularity of the small functional car and enlarge its success as well. To position a roomy and functional 7-seater minivan using the 500’s name may result in a risky operation for the health of the city-car. However, I think the 500L Living is a good product that will work only if it’s well positioned. This new car is part of the second mistake. On the 4th of July, Fiat presented the new members of the 500 family as part of the strategy of the brand of enlarging the success of the Fiat 500. The problem is that the brand heads to a unique product-line identity and risks of being known only for the 500 family. Fiat is much more than the 500. It is an European mainstream brand equivalent to Renault, Peugeot, Opel, VW, or Ford. It is true that in the last 5 years its range of cars has been dramatically reduced and now it doesn’t offer any car in the D-segment, C-MPV, or not even a SW. But the brand can’t limit all of its efforts in only one line of products. It is not possible that the presence of Fiat brand is limited to the success of the 500. For example, the brand’s portal took the 500 family out of it and created a dedicated minisite for those looking for the city-car and its new MPV brothers. In 2012, this model counted for 23% of the brand’s sales in Europe. That isn’t a high number only because of the big demand of the Panda and Punto in Italy. 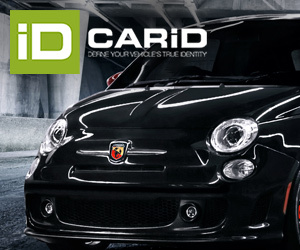 Excluded Italy, the 500 counted for 29% of Fiat’s sales in Europe (Russia and Turkey comprised). The dependence on the 500 becomes even higher where the brand doesn’t have a good market share. In the UK the city-car counted for 67% of the brand’s sales. It was followed by Lithuania with 66%, Belgium, 50%, Spain 37%. In Norway, where Fiat is extremely unpopular, the 500 counted for 80% of sales. In my opinion Fiat should develop two lines of products based on their attributes: the stylish, and the practical world. The 500 is Fiat’s best achievement in the last 10 years, but I’m sure the brand can do much more with other models. I agree with your ideas, but I think that the top management of the company does not want to invest in developing new concepts like the 500, so they prefer to enlarge the product range focused in the success of the 500 and the 500 L. The european market is flat or decreasing and it will be in that mood for 3 o 4 years to come, so investing in new products is so risky taking into account the financial losses. I think Fiat as a group should focus in consolidating its position in Chrysler and gaining market share in the emerging markets , specially in Asia, while maintining a conservative approach in Europe. The new products should be developed for the Brazilian / Chinese / American consumer. That’s right, there are other more important things for Fiat. Europe is a mess and it will be like that for years. But the strategy should exploit not only the 500 but the Panda as well. Both models maintain Fiat alive in Europe. Hello Juan, I am not an expert in Fiat strategy, so I would like to know if you could post data regarding the assumption that the 500 and the Panda maintain Fiat alive. Do you think the other models ( Bravo, Punto ) are already scrapped by Fiat or a revamping could be possible?. 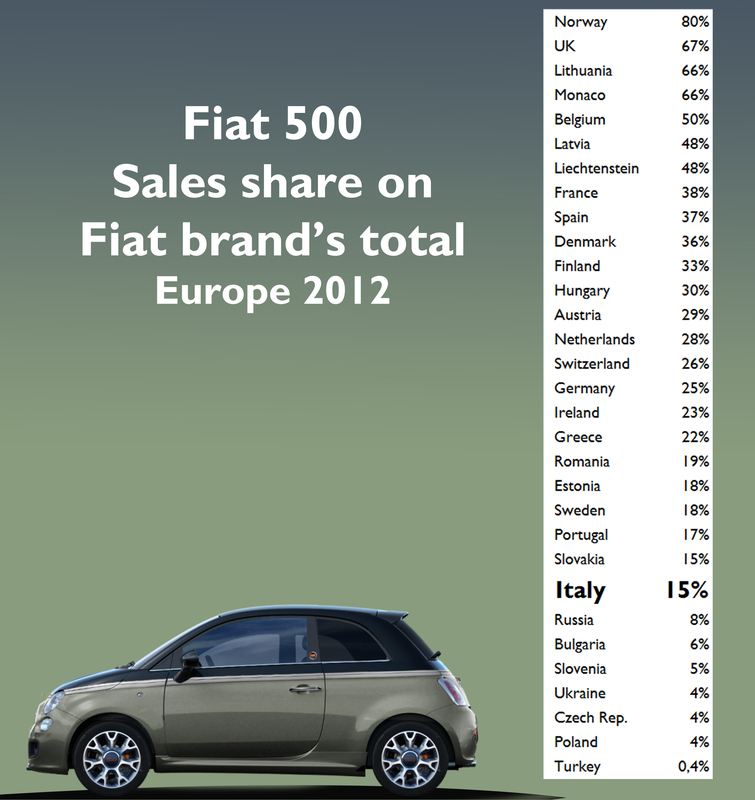 The Panda and 500 counted for 51% of Fiat brand’s sales in Europe in 2012. Of course the Punto and lately the 500L are important, but Fiat is well-known in small segments and reigns with the couple 500/Panda. Since the european market is flat, they try position the “500” Brand in the USA market and other new markets against Mini and other lifestyle cars. Why? because it is as Alfon said the most low risk szenario and they can set the price level higher as a “Panda XL” version, which seen as one of the cheapest cars in the market. This automatically brings me to the question, how do you see the Fiat Group strategy? For me it is a total mess, old products, no hybrids and many many missing model-versions. Now they fully miss the trend of compact SUV here in Europe. However what they do good is the top-end of Ferrari and Maserati, where also the new Ghibli gets good Press responce. The BIG Question – what to do? FIAT – Fact is that Fiat became big with the Topolino – making automobility affordable in Europe even before Volkswagen! I see biggest chance for Fiat to set on afforable good WORLD cars again – positioned against Dacia, Datsun, Suzuki, Chevrolet, Hyundai and Skoda, that are strong and upcoming in all emerging countries. Ofcourse produced locally (avoid import tax) or low cost countries. ALFA & LANCIA – Should focus on the developed & big countries, that see the italian style and DNA back (lick rear-wheel drive) and is positioned against QUALITY brands like, Volkswagen, Volvo, Toyota, Honda, Ford, Buick and in-house Chrysler. Based on combined platforms used for Chrysler and Dodge models, produced in the USA, Europe and China. MASERATI – Set already a good start with the new Quattroporte and Ghibli – This brand can be most succesful to compete against other HERTIGE brands like Mercedes, Audi, BMW and Jaguar. Ofcourse it should also bring out, smaller engines, more versions, SUV, station-wagons and it can set a great image boost from top-to-down for Alfa & Lancia. Ofcourse all produced in Italy. CHRYSLER & DODGE – Basically same as for Alfa & Lancia, but than for home country USA and upcoming countries as Russia and China, where other US-Brands like Buick and Chevy are strong as well. They should offer a higher variety on models range, also convertibles, station-wagons, (mini-) SUV and better quality products and look & feels as well. MARKETING – One of the weakest points I see (altough Maserati is doing a better job here), is the marketing. Bad website and information are a No-Go today. They should buy-off some experts from Volkswagen, that are experts in brand development and image. There task: Sell the VISION and bring CONSISTENCY towards customers to bring back the faith. This will take 10 years, but is worth it ! Bad marketing and hard to understand strategy. That’s the problem, in my opinion. Italians are very good when they want to do it, but sometimes they don’t do it on time. To do the right things means to do them on time as well. using the panda style for this mpv,means for you changing the sign as well? From the 500L to PandaL? Yes. I mean instead of the 500L Living, Fiat should had developed a larger Panda using the same platform. If you see the 500L Living you will remember first a Panda than a 500, only because of its attributes. the lack of a complete range of products in all segments. Again, it shows that Fiat does not the vocation of becoming a truly global brand with a vocation of leadership… it seems that the management of the company is pointing in the direction of promoting 500 brand instead of Fiat brand, maybe with the intention of integrating the whole range of products (Fiat, Chrysler, etc.) into a new brand.. this could help to forget the consumes all the negative stereotypes associated with the brand in Europe. That would explain the idea of relocating the headquarters of the company , merger with Chrysler, IPO, etc. As far as i know, the 500L was initially designed as a basic-low profile MPV not far as it was its smaller predecessor Idea, and only in the latest steps of the development it was decided to “dress” it like their worldwide loved semi-luxury-supermini 500, following similar steps BMW made with the Countryman. This way the standard buyer has now a perception of a near-premium car rather than a standard Fiat allowing a rather bigger profit margin. I believe it was not a bad idea, however the overall design is not perfectly consistent with the standard 500. Anyway -from my sources- Fiat is thinking to ride also the Panda brand for its future “basic” products, like the next generation of large-low priced MPV which now is the Freemont. Thanks for your infortmation Luca. It’s good to enlarge the success of the 500. They did a very good job with the 500L, but the 500L Living is too much and it would fit more with the Panda’s philosofy. However, as you say, Fiat is working on a larger Panda as well. What I see is that the “500” as a sub-brand is more global than “Panda”. So it is the obvious choice to expand. But yes the styling should have been much much better. Yet the funny thing is ugly cars sell. Look at the Mini range and so many BMWs. I think you have a point. We know that Fiat-Chrisler strategy about the Fiat brand is not just to develop the 500 sub-brand but also to possibly expand the Panda style/concept to other models. However there’re counterarguments as well. 1) Current sales of the 500L are encouraging, while Panda has somehow disappointed outside of Italy. Hence the development of a new model based on 500L. 2) New Fiat-Chrisler cars need to sell on the North American market. 500 is already established there, so it should be easier and cheaper to market a spin-off product rather than a new one. 3) I see a trend to make in-brand styling increasingly homogeneous. WW-Audi for instance seems to be churning out cars that look the same although of different sizes. Maybe Fiat-Chrisler is betting on that too. The 500 Living looks remarkably similar to the 500L. More difficult would be perhaps to design a large MPV that looks like a Panda. Thanks for your point Roberto. That’s true too. American market is now a big part of the decision making in Italy, and the Panda doesn’t play an important role in that sense. The past to define the present! Looking to the 1971 FIAT 127. The 500 has been a bright spot for FIAT and in conjunction with consumer trends which will continue to drive sales of distinctive small cars, the Italian group is rightly looking to extend its portfolio of aspirational vehicles. However, it should seek to differentiate them from its mass-market vehicles and, being a number, it is difficult to envisage how FIAT can stretch the 500 sub-brand beyond the 500C, 500L and 500X derivatives. The addition of a brand is therefore advisable – maybe Fiat rethinks its names. The new F127 by FIAT? The punto of 1998 was having projector lamps and the one launched after is having traditional halogen ones. None of the cars have inbuilt navigation, touch panel, or key less start stop! No new feature…. The best car of Fiat has less features then hyundai i10, and this is the problem that’s pulling this iconic brand behind! It should learn from TATA who successfully took the JLR out of problems as a successful brand..